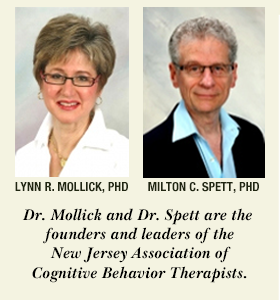 An abbreviated version of this article appeared in the New Jersey Psychologist. Every working day a man takes the commuter train from New Jersey to New York City. As the train passes over a river, the man rolls up page 5 of the New York Times and throws it into the river. Finally the commuter sitting next to him asks him why he does this. "To keep the wild elephants away," responds the first commuter. "But that's ridiculous. There isn't a wild elephant within 5,000 miles of here." "Yes, my technique is very effective," replies the compulsive commuter. 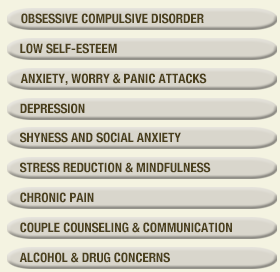 1.1 Obsessions Cause Anxiety; Compulsions Are Attempts to Reduce that Anxiety. Obsessions are unwanted, distressing thoughts that come into people's minds unbidden. Because patients do not want to have them, these thoughts are often called "intrusive" thoughts. They are usually embarrassing, sexual, aggressive, religious, or frightening. Obsessions often begin with the words "What if...?" For example, "What if I am gay?" OCD sufferers try to suppress these thoughts, but the more they try to suppress the thoughts, the more frequently and intensely they come. Compulsions are intense urges to perform certain behaviors or think certain thoughts. (The latter are called "thought compulsions.") Compulsions often involve doing or checking things a specific number of times. Some examples of compulsive behaviors are repeatedly checking to make sure that the gas is turned off, getting multiple medical tests, or washing some body part that the patient believes is contaminated until the skin is raw. Compulsive behaviors reduce the anxiety caused by obsessions, and make patients feel better. But soon the obsession returns, and patients begin to wonder, "What if I didn't really wash my hands carefully enough? I better wash again just to be sure." Or "What if the lab confused my AIDS results with someone else's? I better get another AIDS test, just to be sure." Or "Maybe I didn't really check the gas. I better go back and check again, just to be sure." Or "Maybe I should check the gas five times to be really sure I have checked it properly." Performing compulsive behaviors reduces the anxiety, and this anxiety reduction reinforces the compulsive behavior, making it more likely to occur the next time an obsession occurs. Many OCD patients report that their symptoms change over time. One patient's obsession that she will harm her child disappears and she develops the obsession that her house will be robbed when she is out, so she must check that every door is locked. But she still is not 100% certain that she checked carefully enough, so she checks each lock five times. Somehow, checking five times feels right and relieves her anxiety. But then she can never be comfortable leaving the house until she has checked every lock five times. And then five checks becomes five sets of five checks, and eventually she cannot leave her house until she has performed a checking ritual that requires 90 minutes.. Most OCD patients know that the dangers they fear are very unlikely, and that it is unnecessary to devote so much time and energy to guarding against these dangers. And yet they feel unable to go on with their lives until they have performed their rituals. Most OCD patients come to berate themselves for their illogical obsessions and compulsions. Unfortunately, berating themselves makes OCD patients feel worse about themselves, increasing their anxiety, worsening their OCD, and often triggering depression. Some OCD patients experience compulsions without obsessions, impulses to do certain things in certain ways, with no reason other than "it just feels right." Compulsions without obsessions sometimes take form of making things "just so," or doing certain things a certain number of times, or putting things in a certain order, or making things even. For example, if they do something with their right hand, some OCD patients feel a compulsion to do the same thing with their left hand. "Mental compulsions" are compulsions to say something to oneself a certain number of times and/or in a certain way that just "feels right," and reduces anxiety. One patient had the compulsion to look at a doorway in a certain way, a certain number of times, before he could walk through the doorway. He had no explanation for why he felt compelled to do this or what would happen if he walked through the doorway without performing his ritual. He had only a vague dread of walking through the doorway without performing that ritual. And like many OCD patients, if he did something "wrong" in the middle of his ritual, he would have to start all over at the beginning. Over time his ritual became so elaborate that it could take him half an hour to walk through certain doorways. Compulsions without obsessions are probably maintained by anxiety reduction. Making something "right" or "just so" or "even" or "orderly" feels comfortable to OCD patients, and reduces any anxiety over that thing not being "right." Behavioral interventions – exposure and response prevention (ERP or EX/RP). (Sometimes called "exposure and ritual prevention.") Confront situations that evoke the obsession and experience the anxiety, but don't perform the compulsive behavior that serves to reduce that anxiety. Cognitive therapy (CT). Change OCD patients' beliefs about their obsessions from dangerous, intolerable concerns to "fleeting, meaningless thoughts." Dispute the obsessive thoughts or ask questions and suggest experiments which will cause patients to doubt the validity of their obsessive thoughts. CBT for other psychological dysfunctions. Overcoming any psychological dysfunction will diminish other psychological dysfunctions, including OCD. Building up other aspects of OCD patients' lives — relationships, self-esteem, enjoyable activities, gratifying accomplishments — will diminish the time and energy OCD patients devote to their obsessions and compulsions. Exposure occurs when OCD patients experience their obsessions and the situations that provoke their obsessions. When patients experience their obsessions spontaneously, they should focus their attention on their obsessions, and wait passively for their obsessions and anxiety to subside. Patients can also intentionally provoke their obsessions. Mental health professions believed that exposure works best when it is intense, frequent, and prolonged, and when it lasts long enough for the patient's anxiety to increase, reach a peak, and then diminish by at least 50%. But Meuret et al. (J. of Consulting and Clinical Psychology, October, 2012) point out that these assertions have never been confirmed by research. They provided four sessions of ERP to 34 patients suffering from panic disorder. They found that there was no correlation between improvement and either the intensity of anxiety provoked during exposure or the amount of anxiety reduction during exposure. They speculated that the exposure restructured patients' catastrophic expectations, regardless of the degree of anxiety provoked during exposure. In vivo exposure asks patients to experience the actual situations that evoke their obsessions. Imaginal exposure asks patients to visualize their obsessive scenarios, or to write or record scenarios describing their obsessions, and then read or listen to these scenarios over and over and over and over. In vivo exposure is more powerful than imaginal exposure, but not always feasible; patients who obsess that they are child molesters cannot be asked to molest children. Exposure can be performed in sessions or between sessions. In order to increase the effectiveness of an exposure, intrepid patients can try to increase their anxiety by imagining their most-feared outcome while they are doing exposure. Patients are often reluctant to do exposure exercises. To make the exposures easier, patients can begin by exposing themselves to less anxiety-provoking situations, then gradually work up to more anxiety-provoking situations. Let patients determine which exposures they can perform, and how quickly they can move on to more anxiety-provoking exposures. Patients should not try to leave the situation that evokes their obsession. Patients should not attempt to distract themselves from their obsessive thoughts and the resulting anxiety. Patients should not seek reassurance that their obsessive fears are unwarranted. If patients believe they have touched something dirty and been contaminated, they should not wash their hands. If patients fear they might stab someone with a knife, they should not avoid using knives, nor should they put their knives out of sight. If patients believe they have a disease, they should not check their bodies, ask friends if they look sick, or go to the internet to check the symptoms of the disease they believe they have. Note that researching diseases on the internet can be either an exposure, which is therapeutic, or a compulsion, which is counter-therapeutic. The key issue is the patient's motivation. If OCD patients go the internet to imagine that they have a disease and experience the resulting anxiety, that is exposure and that is therapeutic. If they go to the internet to determine whether they have a disease, that is a compulsion and is counter-therapeutic. Similarly some patients go from one doctor to the next, doubting each doctor's report that they are healthy. For these patients, not going to the doctor constitutes response prevention and is therapeutic. But other patients refuse to go to any doctor because they fear discovering that they have a fatal disease. For these patients, going to the doctor constitutes exposure, and is therapeutic. When patients cannot or will not do response prevention, they can obtain some benefit by modifying or disrupting their compulsion. As with graduated exposure, patients should decide how much response prevention they can tolerate, and how quickly they can move on to more anxiety-provoking response preventions. For example, if a patient experiences the compulsion to check the gas five times, you can ask that patient to check the gas four times or six times. The concept is that each time a patient performs a compulsive behavior, the impulse to perform that compulsion becomes stronger. But each time a patient refrains from performing a compulsion, or modifies the compulsive behavior, the impulse to perform the compulsion becomes weaker. Delaying compulsions is another form of graduated response prevention. If a patient has the compulsion to check that a door is locked, ask that patient to leave the house and wait sixty seconds before coming back to check the lock. If the patient does this, ask the patient wait two minutes before checking. Letting a few minutes pass usually reduces the intensity of the compulsive urge, and makes it easier for the patient to do complete response prevention – in this example, to leave home without checking the lock at all. As with other forms of response prevention, it is best to ask patients to determine how long they can wait before performing the compulsive behavior. Asking patients to imagine their worst case scenario while refraining from performing the compulsive behavior increases the effectiveness of response prevention. In the example above, the patient would imagine that the house is unlocked and will be burgled when the patient leaves home without checking the lock. Sometimes OCD patients take big steps forward unexpectedly. We have seen patients who were unable to do a response prevention for months, then come in one week and announce that they did it. Not only did they refrain from performing their compulsive behavior, but they frequently report that they experienced little anxiety, and they wondered why they had not done the response prevention months earlier. Remind yourself that the discomfort of ERP is temporary, but the discomfort of OCD is permanent. Doing ERP is uncomfortable in the short run, but alleviates OCD in the long run. Avoiding ERP is comfortable in the short run but maintains or worsens OCD in the long run. Every time you perform a compulsive ritual, the urge to perform that ritual becomes stronger. Every time you resist performing the ritual, the urge to perform that ritual becomes weaker. You can tolerate anxiety. Doing ERP may cause anxiety, even high anxiety, but that anxiety is neither intolerable nor dangerous. Some OCD patients say that they cannot tolerate the anxiety created by ERP, but this is not true. They choose to not tolerate the anxiety that ERP would create. For some of these patients anxiety reduction techniques may be helpful before they undertake ERP. But note that practicing anxiety reduction conflicts with the basic concept of ERP – doing nothing to diminish obsessions or the anxiety they create. However with some difficult OCD patients you have to be flexible and creative. Seek out and welcome situations that evoke your obsessions. View these situations as opportunities to work on overcoming your OCD. Tolerating the anxiety and not performing the compulsion means you are winning the fight against OCD. View your OCD as an alien force that is trying to control you. But you are stronger than that force. You can face it, fully experience it, and not let it tell you what to do. Every time you do what the OCD tells you to do it becomes stronger. Every time you resist doing what the OCD tells you to do the OCD becomes weaker. Do not become discouraged when you have a bad week or a bad month. Every week will not be better than the previous week. To see progress you have to look at longer periods of time. To evaluate how patients are doing, compare the last three months to the previous three months. Also remember that stress will temporarily worsen OCD (or any psychological problem). A bad week or a bad month usually means that patents are under extra stress, not that they are regressing. 2.6 Why Does ERP Work? Behavioral theory: habituation. Not acting on an obsession creates anxiety, but repeatedly not acting on an obsession leads to habituation. Habituation means that if a person repeatedly experiences a particular situation, the person's response to that situation diminishes and eventually disappears. If a patient experiences an obsession and the resulting anxiety for frequent, prolonged periods, the anxiety response to the obsession gradually diminishes and eventually disappears. But habituation only occurs if the patient experiences the anxiety and waits passively for the anxiety to diminish by itself. If the patient performs a compulsion, the compulsion reduces the patient's anxiety, preventing habituation from occurring – response prevention is probably the most important component of CBT for OCD. In addition, performing the compulsion reduces the patient's anxiety, and this anxiety reduction reinforces the compulsive behavior, strengthening the patient's tendency to perform the compulsive behavior in the future. Cognitive theory: cognitive change. Not acting on obsessions demonstrates to OCD patients that their obsessive concerns are unwarranted. OCD patients learn that no harm comes to them or others if they do not perform the compulsive behavior. Not performing the compulsion serves as an experiment which disproves the content of their obsessive thought (Foa & Kozac, Psychological Bulletin, January, 1986). Remember the vignette at the beginning of this article about the compulsive commuter who threw page 5 of the New York Times out the train window to keep the wild elephants away? A cognitive theorist would assert that because the commuter never refrains from throwing the New York Times out the window, he never learns that his compulsive behavior is unnecessary. But if he practiced response prevention, if he refrained from throwing the paper out the window, no wild elephants appear and he would learn that throwing the paper out of the window is unnecessary. 3.1 Do not express criticism, anger, or tell OCD patients to just "cut out the foolishness." Family members who do not suffer from OCD often have difficulty understanding why the OCD patient cannot just stop the compulsive rituals. Family members often need education about how difficult it is for OCD patients to refrain from performing their rituals. Explaining the genetic component of OCD can help family members understand the difficulty of resisting OCD compulsions. Tell family members that OCD patients have an illness and cannot "just cut out the foolishness." If a person could not walk due to a broken leg, no one would tell that person to cut out the foolishness and just walk. Family arguments about OCD patients' compulsions exacerbate the OCD by increasing patients' anger, self-criticisms, depression, and feelings of hopelessness. 3.2. Usually do not reassure OCD patients that their obsessive fears are unwarranted. Reassurance reduces OCD patients' anxiety in the short run, but increases the OCD and reassurance-seeking in the long run. Tell family members that OCD patients need to learn to reassure themselves instead of seeking reassurance from others. And to prevent family conflicts, ask OCD patients to agree that family members will not provide the reassurance patients usually seek. 3.3 Usually do not do things for OCD patients that are difficult for OCD patients. To do so would enable patients to avoid exposure to anxiety-provoking situations and impede treatment. Although these three types of family behaviors are counter-therapeutic, families (and therapists) must use a little common sense. Sometimes the consequences of not providing reassurance or not helping the OCD patient can cause serious problems, such as the loss of a job. And sometimes patients need more time and more therapy before they can give up asking for reassurance or seeking help doing things that are too anxiety-provoking for patients to do themselves. In a pilot study, Abramowitz et al. (Behavior Therapy, September, 2013) found that including a significant other in all sessions led to improvements which were superior to those reported in individual treatment of OCD. Several anti-depressants have been found to be more effective than placebos in treating OCD. But this is true only for patients who are not receiving cognitive-behavior therapy. Several studies have found that CBT alone is just as effective as CBT plus medication. For example, Franklin et al. (Professional Psychology, April, 2002) found that CBT plus medication reduced OCD symptoms by 65% while CBT without medication reduced OCD symptoms by 63%, a non-significant difference. March et al. (J. of the American Medical Association, October 27, 2004) found that CBT plus Zoloft reduced scores on the Yale-Brown Obsessive-Compulsive Scale (Y-BOCS) by 12.8 points while the CBT alone group reduced Y-BOCS scores by 12.0 points, another non-significant difference. Finally, Van Balkon (J. of Nervous and Mental Disease, August, 1998) concluded that Luvox added nothing to the benefits of either cognitive therapy or ERP for OCD. One problem with concomitant medication is that psychiatrists often tell OCD patients that they have a "biological imbalance" or a "brain dysfunction" that requires biological treatment. This is untrue. Several studies have found that CBT makes biochemical changes in OCD patients that are similar to the biochemical changes made by medication (for example, Baxter et al., Archives of General Psychiatry, September, 1992). And effective psychological treatment makes permanent changes, while the benefits of medication end as soon as patients stop taking their medication. When patients believe they have a biological disorder, they tend to attribute increases in symptoms to biochemical rather than psychological causes. Then they consult their psychiatrists who "adjust" their medication in an attempt to control the increase in symptoms. Medication can cause patients to attribute their OCD to biological causes, to focus on drug treatment, and to fail to devote the necessary time and energy to the psychological causes and treatment of their OCD. The key question is "Whom do patients call when they experience an increase in their symptoms?" If they call their psychiatrist, they are viewing their OCD as a biological disorder that needs to be treated biologically. If they call their psychotherapist, they are committed to psychological treatment and they are much more likely to overcome their OCD.